Urushiol, the chemical in poison ivy, is also harvested from the Japanese lacquer tree to coat lacquerware. 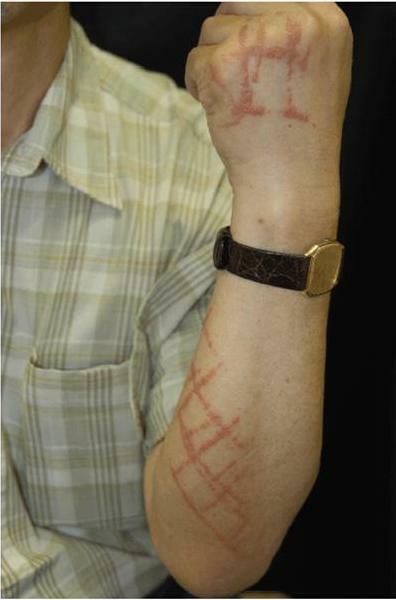 Here, a rash caused by lacquerware that likely was not properly cured. You'd think that someone who is a science correspondent and is as allergic to poison ivy as I am would have heard of urushiol, but no. I didn't recognize the word when I saw it a week or so ago. Now, thanks to my new beat (Joe's Big Idea), I'm allowed to dig a little deeper into stories, and what I learned about urushiol is pretty amazing. It all started with a press release I received from the American Chemical Society highlighting an article in the Journal of Organic Chemistry. Urushiol is the oily sap on poison ivy leaves that causes all the problems.And it's not only poison ivy, which doesn't grow in California. Poison oak, poison sumac and poison dogwood all contain urushiol and will also give you a nasty rash. In the paper, Rebecca Braslau and her colleagues at the University of California, Santa Cruz, describe a nontoxic spray that will fluoresce in the presence of urushiol. Braslau has gotten the rash more times than she'd care to remember. She knows how to avoid the plants herself, but she has a problem. "My husband's a geologist. He tramps around in the Santa Cruz mountains," she tells Shots. Her husband is one of those lucky people who isn't allergic to urushiol. "When we first got together he wasn't very careful about it, and so he would get it on his arm and he wouldn't even know it," Braslau says. And then he'd put his arm around her and she'd break out. So Braslau got to thinking: "There's got to be some way to deal with this, and I just had this eureka moment because I thought about it for a couple years." The eureka moment involved a class of chemicals known as nitroxides. Braslau was able to develop a nitroxide-based solution that would react only with urushiol. By adding a fluorescent dye that would show up only when the reaction occurred, she could spray her nitroxide solution on a surface, and if the urushiol was there, the surface would light up. She says until there is thorough safety testing, it's probably best to use the spray on inert things like shoes or backpacks to see if the oil is there. "Ultimately I would love to be able to spray it on my arm, or my husband or my dog, and find out where this stuff is," she says. The compound Braslau describes in the article is just a proof of concept. She says she needs to find a better dye, maybe even one that will light up without having to shine a fluorescent light on it. She's got a patent and would be happy to hear from potential investors. So, OK, Braslau's spray lets you know you've been exposed to urushiol. Then what, I asked her? TecNu is a water-free cleanser. There are other soaps that work getting the oil off — for example, that stuff called Goop car mechanics use to degrease their hands, Braslau says, and some dish-washing detergents. But she relies on TecNu. Mark Christensen, a chemist at Oregon State University, works on TecNu for its manufacturer, Tec Labs of Albany, Ore. I asked him why TecNu was so good at removing urushioll from someone's skin, and he said it was because it contains a benzene ring which has ortho hydroxyls, and "then para to that off of that benzene ring is a long alkyl unsaturated chain, 15 to 18 carbons." Not quite the simple explanation I was hoping for. After he explained it a bit more, the idea seems to be the chemicals in TecNu can mix with urushiol so you can wash it off your skin. One other interesting thing about urushiol: It's harvested from the Japanese lacquer tree and prized as a lacquer for artwork. Antoine Wilmering is an expert in urushi lacquerware, as it is known at the Getty Foundation in Los Angeles. He says you apply multiple layers of the lacquer with a brush, cure and polish each layer, "and then you get these really beautiful shining surfaces." The good news is if you properly cure the lacquer, it not only hardens but it also loses its allergenic properties. But an object covered with improperly cured urushiol lacquer can still cause a rash. Here in California, we have news of breakthroughs on another awful skin condition, this one caused by poison ivy. One scientist developed a spray that can reveal the presence of the oily residue in poison ivy. For people who are highly allergic, the spray would let them know when they are exposed, so they could take aggressive steps to wash the oily residue away. NPR's Joe Palca was itching to do this story. JOE PALCA, BYLINE: I wanted to do this story because I am one of those highly allergic people. REBECCA BRASLAU: Me too. This is how I got started on all this. PALCA: Rebecca Braslau is an organic chemist at the University of California, Santa Cruz. Braslau has that horribly itchy poison ivy rash more times than she'd care to remember. She knows how to avoid the plant herself, but she can still get still get the rash. How? BRASLAU: My husband's a geologist. He tramps around in the Santa Cruz mountains. PALCA: And her husband is one of those lucky people who isn't allergic to the oily compound found on poison ivy leaves. BRASLAU: When we first got together he wasn't very careful about it and so he would get it on his arm, and he wouldn't even know it. PALCA: And then he'd put his arm around is wife and the oil on his skin would rub off on her, and she'd wind up breaking out in a rash. Her husband tried to be more careful, but Braslau got to thinking hey, I'm a chemist. BRASLAU: There's got to be some way to deal with this, and I just had this Eureka moment because I thought about it for a couple years. PALCA: The Eureka moment involved a class of chemicals known as nitroxides. Braslau studies nitroxides and she developed a nitroxide based solution that would only react with the oil in poison ivy. Then she added a fluorescent dye that switched on when the reaction occurred and bingo, she had a poison ivy detection system. She describes her work in the Journal of Organic Chemistry. Braslau says it will take a lot of safety testing before she'd be confident enough to use her spray of someone's skin. BRASLAU: Right now we're talking about maybe spraying it on your hiking boots, or your firefighting equipment, or your backpacking equipment or your chain saw, or inert objects where we wouldn't have to worry about applications onto human skin. Ultimately, I would love to be able to spray it on my arm, or my husband or my dog, and find out where this stuff is. PALCA: OK, so her spray tells you the oil got on your hiking boots, but then what do you do. BRASLAU: TecNu is a water-free cleanser. Mark Christensen is a chemist at Oregon State University who works with TecNu's manufacturer, Tec Laboratories of Albany, Oregon. I asked Christensen why TecNu was so good at removing poison ivy oil from someone's skin and he said it was because it contains a benzene ring which has ortho hydroxyls. MARK CHRISTENSEN: And then para to that, off of that benzene ring it has a long alkyl unsaturated chain, 15 to 18 carbons. PALCA: A little more technical than I was expecting, but the idea seems to be the chemicals in TecNu can mix with poison ivy oil so you can wash them off your skin. There are other products if you can't find TecNu. Braslau says the hand cleaner called Goop that auto mechanics use seems to work - as do some dishwashing liquids. Or you can just say no, stay indoors and keep away from any spouse, friend or pet who likes to walk in the woods. Now there's one other interesting thing I learned while working on this story. Turns out there a tree in Asia that produces great quantities of the poison ivy oil and artists treasure it. Why? Because it the oil makes an outstanding lacquer. ANTOINE WILMERING: And then you get these really beautiful shining surfaces. PALCA: The good news is the curing process not only hardens the lacquer, it also causes it to undergo chemical changes so it no longer can make you itch. Joe Palca, NPR News, Washington.